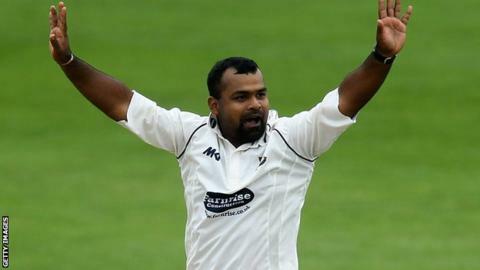 Sussex have signed former Lancashire League professional Ashar Zaidi on a two-year contract. The 32-year-old all-rounder joined Sussex on a non-contract basis in September and made two appearances in the County Championship. Pakistan-born Zaidi made his first-class debut in 1999 and has previously played for Pakistan A. The slow left-armer has spent the last three years with Accrington Cricket Club and holds a British passport. He took figures of 4-57 on his debut for Sussex against Yorkshire and scored 45 in the last match of the season against champions Durham. Zaidi, who made 88 first-class appearances for Islamabad, has most recently been playing in Bangladesh's Dhaka Premier League for Gazi Tank. He described it as "an honour" to sign for Sussex. "This is a really big achievement for me, especially after a few years' break from the pro game," he said. "I'm really grateful for the chance that they have given me. "I'll be aiming to justify that chance over the next couple of seasons. I'm hoping for enough opportunities to perform, and to open my chances for the future." Sussex captain Ed Joyce welcomed the news that Zaidi had signed a permanent deal at Hove. "Ash fitted into the squad really well and impressed everyone with his canny left-arm spin and attractive strokeplay," Joyce said. "He will hopefully fulfil the spin role for us in four-day cricket, while possibly also allowing us to play an extra seamer when the conditions suit. "He is also a very capable one-day cricketer as seen by his recent performances in the Dhaka Premier League and we're hopeful he can play a big role for us in both the shorter formats."